Living Online: Who Is iPhone Girl? Who is iPhone girl? Maybe I need tell you a little bit about this story. A British man wrote posted a complaint on Macrumors that says he bought a new 3G iPhone, and he found his phone has some an Asian female's photos, who dresses work uniform and smiling. He wants know if other people who bought iPhone also have similar photos. After that, people called this mystic Asian girl is "iPhone Girl", so this photo seems so popular around the world. Of course, people are searching this iPhone girl. Someone built a website. 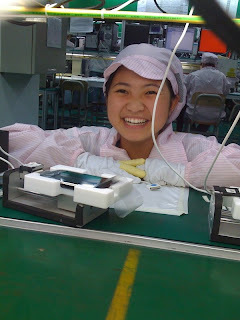 Finally, they found her who is a worker of Foxcon, that is the company where the the phone was assembled in China. Some Chinese paper called the mystery worker "China's prettiest factory girl". Some people say she is fired cause she left photo in a new iPhone, but company claimed "it is a beautiful fault" late, and confirmed this girl still work for the company.